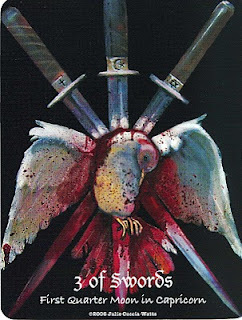 Today's Draw: Three of Swords from the Maat Tarot by Julie Cuccia-Watts. Has someone broken your heart? What did you do? And are you willing to see it through different eyes? In the book that comes with this deck, Cuccia-Watts observes the scientific principle that energy is never lost or destroyed, it just changes form. So love is never lost, it just becomes something else. And, if you think logically, the love you had before still remains. And now you have something different to add to it. But what was love before, was still love. Because of this, she posits that heartbreak isn't so much about what you've lost, because you haven't lost anything. Heartbreak is really just the pain that comes from losing control.